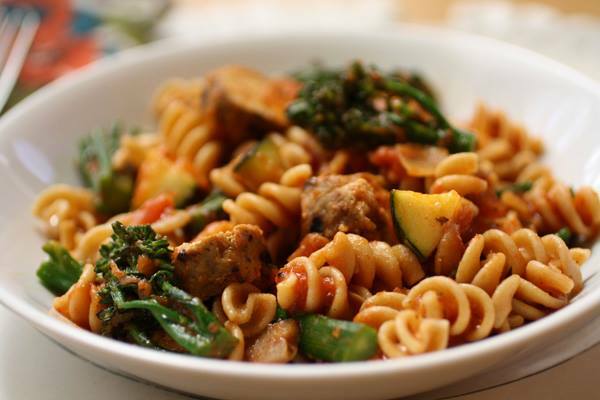 Wholegrain pasta – easily available in the supermarkets (buckwheat pasta if you are going gluten free. You can also use the rice or corn pastas, though the buckwheat is denser in nutrients). I also really like the bean/lentil based pastas available now from health shops and independent grocers – they taste great and increase your protein intake. Chop the garlic finely, and cut up the mushrooms into very small pieces (1/2 cm in size). Fry these up in the pan with olive oil on a medium heat, until they reduce down and are nice and soft – about 10 minutes. Add a squeeze of lemon juice and some salt and pepper. In the meantime, put the pasta on to boil and cook until firm but ready to eat. Slice a zuccini in long thin strips (you could also use carrot) and fry up in a separate pan. When these have cooked, move to one side and fry up the strips of green leafies. Combine the pasta and mushroom ‘sauce’ in a bowl – stirring it through. Add the other ingredients, including some torn basil, some extra olive oil and a squeeze of lemon to taste.